Government at all levels must routinely evaluate compliance with the other 5 Es. This includes the state of laws (Equality), the adequacy of minimum Engineering standards and compliance with best practices, the equitability and effectiveness of Enforcement, the reach and effectiveness of Education, and the effectiveness of Encouragement measures. Evaluations must use modern tools (such as video of counts/behavior, improved reporting forms for crashes, etc.) and sound methodologies to measure bicyclists’ numbers/mode-share, behaviors, crashes, citations, miles/proportions of road and bikeway facilities designed to best practices, and miles/proportion at minimum standards. I Am Traffic encourages government partnering with experts in advocacy and academia to produce sound high quality evaluation programs. Setting mode share targets for walking and bicycling and tracking them over time [see evaluation for more on data collection]: A byproduct of improved data collection is that communities can establish targets for increasing the percentage of trips made by walking and bicycling. Collecting data on walking and biking trips: The best way to improve transportation networks for any mode is to collect and analyze trip data to optimize investments. Walking and bicycling trip data for many communities are lacking. This data gap can be overcome by establishing routine collection of nonmotorized trip information. Communities that routinely collect walking and bicycling data are able to track trends and prioritize investments to ensure the success of new facilities. These data are also valuable in linking walking and bicycling with transit. 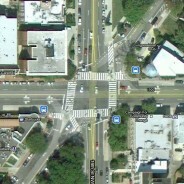 An evaluation of bicycle facilities and bicyclist behavior at the 6-way intersection of U Street, 16th Street and New Hampshire Ave. in Washington D.C.